The Cross in a Congressman | Lift Jesus' Cross! ← I Give You My Calendar . . . My Clock . . . My Feet . . .
Posted on September 22, 2011	by Lift the Cross of Jesus! That’s right. I saw the cross of Christ in a congressman–Congressman Christopher Smith of New Jersey to be exact. 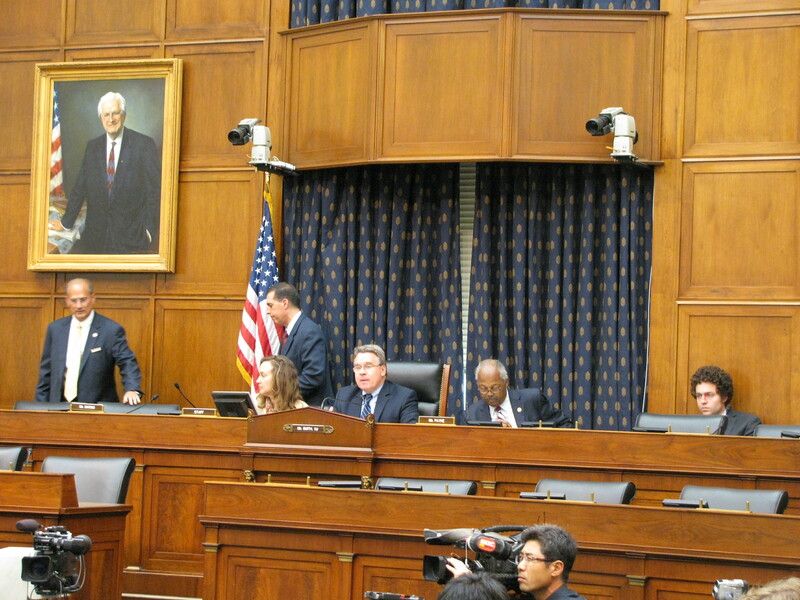 Congressman Smith was chairman of the Congressional Hearing on Human Rights for North Koreans on Tuesday afternoon. I was at the hearing, my new book in hand, my prayers warriors around me, and the prayers of many of you following me into the Rayburn Building where the hearing was held, across from the United States Capitol. 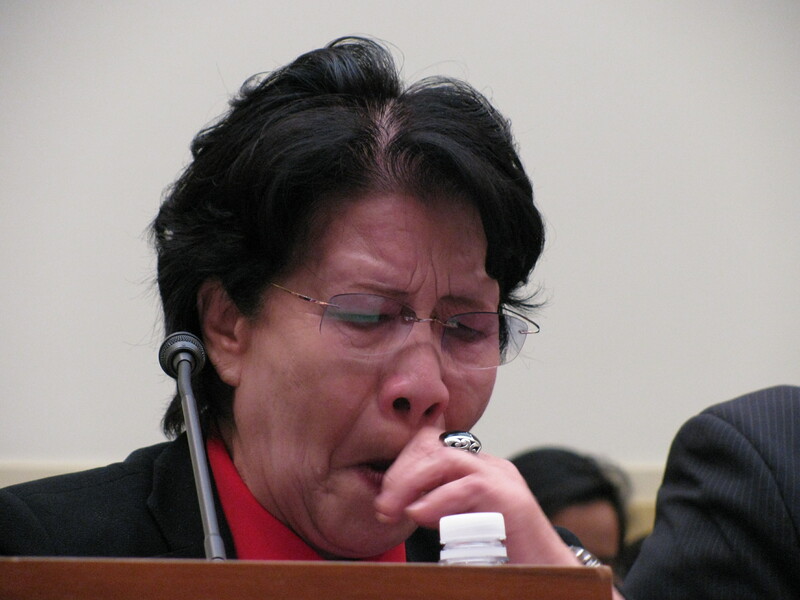 Congressman Smith and his colleagues, Congressman Wolfe, Congressman Payne, and Congressman Bass listened to the horrific stories of torture and starvation experienced by two women who survived the prison camps and escaped North Korea. Congressman Smith (center of picture) repeatedly thanked the North Korean women for coming to testify of YEARS of suffering and torture they endured in North Korean prison camps. This hearing was longer than any I’ve been in—2 ½ hours long. It was recorded by C-SPAN 2 and showed 3 times that night. While hiding in a safehouse in China, Gil Su drew pictures of what his life was like when he lived inside North Korea. He hopes someone will believe his story. All congressmen asked direct poignant questions and allowed the defectors to answer deep questions such as how do you see the situation in NK being resolved? What can we do to help you? It was an incredible hearing. It seemed everyone was ready to roll up their sleeves and DO something about this! So, you’re probably wondering about the cross in a congressman? Well, you can imagine that the highlight for me was after the hearing when Congressman Smith invited me to his office for coffee with him and those who testified at the hearing. WOW! This may seem like a small thing, but you know I watched this man honor the defectors, honor my friend Suzanne Scholte who chairs the North Korea Freedom Coalition, I watched him honor everyone else as he led the hearing. Then we sat down in his office. At his request, his staff brought oatmeal cookies and coffee and Congressman Smith picks up the thermos and begins pouring for everyone gathered. 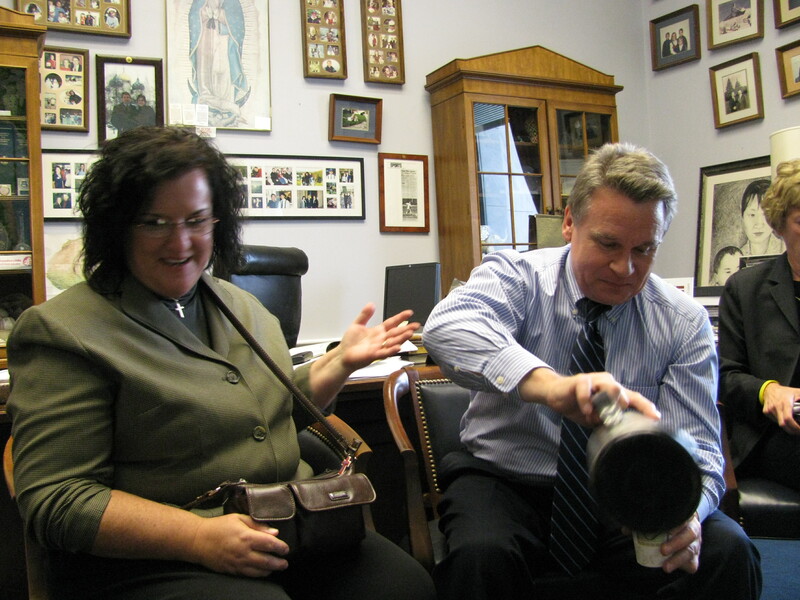 Congressman Christopher (Christ-bearer) Smith Pours Coffee, a servant of the people in public and in private. Now, maybe I was in a congressman’s office with the beautiful white dome of the Capitol Building shining through the window, but I thought about Jesus. I saw Jesus in a man who knew how to lead others by serving them. I saw a man who cared enough to set up a hearing to give North Korean defectors a voice in a world that seems to have forgotten them. Now he poured coffee for everyone. It honestly reminded me of the upper room when Jesus served his disciples despite all that was on his mind that evening. This is the cross. This is the cross in a congressman who has a plaque on his desk that says “PRAY” and I’m told that he fights for the unborn children in our nation more than any other congressman on the hill. So when someone tells you our government is falling apart you tell them for me that all is not lost. There is hope. The cross is still in congress. In fact, the cross is in a congressman, Congressman Chris Smith. This entry was posted in The Cross and the Christian and tagged Congressional Hearing; Congressional Hearing for Human RIghts in North Korea, Congressman Chris Smith, Congressman Smith, cross in congress, Human Rights, North Korea, the cross in a congressman. Bookmark the permalink. Thank you, Hope, for your report! More need to be made aware of what this man’s doing! May the Lord richly bless him, and you! Jean, believe it or not there are more like him. There’s Congressman Royce, Congressman Wolfe, and Congressman Payne. They are incredible leaders AND they each have a copy of my book! Thank you so much for sharing your experience in DC. Not much good comes out of their so it’s wonderful that the message of those suffering North Koreans is getting told. Bless you for this work! Rebekah, as I walked through the halls of the Rayburn buildling, where most of the congressmen have their offices and hold the hearings, I realized the words that those walls must have heard over the years. While there are a few who go into politics for fame or power, I believe there are still a majority who go in to make a difference. The first rule of journalism is to report the wild card, cause a stir, sell an article. But I am more convinced than ever that we need to speak light into the lives of those leaders rather than join the media’s negativity and curse the darkness. What a joy to find congressmen who care! Beautiful, Hope … great report! Roxann, what an honor to hear from you! Please feel free to add any insights you have or new reports you can share on the situation in North Korea. You’re right…there are some really fine people there. This is a good reminder to pray for our leaders. I agree. And maybe there are some leaders who aren’t on the hill yet but are being called by God to run for office and carry the light to The Hill.